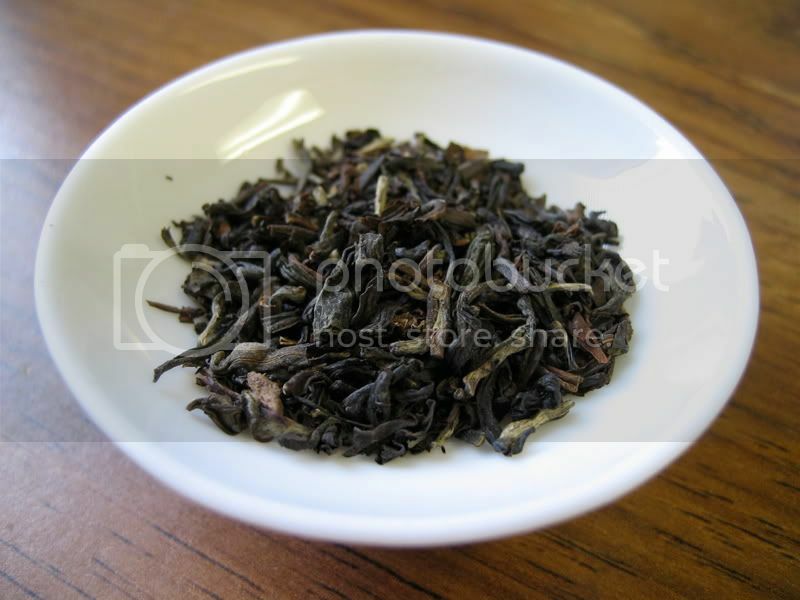 Today, I'll review another Darjeeling I purchased from Upton Tea Imports. This one is the Tindharia Estate FTGFOP1 Second Flush (DJ-53). As opposed to my other reviews, which have been about the teas I like, this one will not be as glowing. To be honest, I don't really like this tea. Sure, it's a lot cheaper than the others I have written about, but I'd rather have one cup of a good Darjeeling than two of this one. Don't get me wrong, it's not bad, it just doesn't do much for me. The dry leaves look fine-- a bit dark maybe, but otherwise just fine. This is another "bottom of the barrel" picture, so it's not very representative. It is an FTGFOP, though, so they were quite nice when I first opened the package (see this page for an explanation of this grading system). The smell is a bit off, though. I don't think any Darjeeling smells repulsive, but as far as Darjeelings go, this one is a bit boring. Unlike some other Darjeelings which have a rich bouquet of aromas, this tea has one strong fruity smell (though I can't think of any fruit in particular that it smells like), and that's it. It smells nice, but also quite simple-- and not in a good way. The infusion is also fairly boring. It has all the right Darjeeling components-- a nice hint of astringency, a muscatel note, and a bit of sharpness while still remaining light in weight. Still, it seems as though these are the only flavors in this tea. Nicer Darjeelings will have unique signatures of flavors (maybe almond, or stonefruits), and will make you really concentrate in order to unlock all its secrets. This tea hides nothing. Perhaps it is due to its higher level of oxidation (according to the Upton site), but this tea is comparable to a picture drawn with the 8-color pack of crayons, as opposed to a masterpiece created using the 150-color box (with the included crayon sharpener). For all its shortcomings, though, this tea is still drinkable. 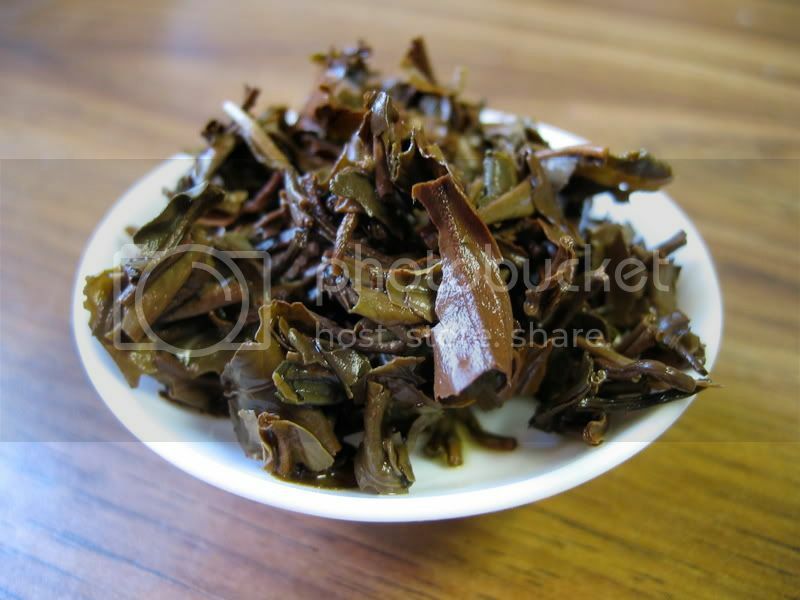 If you're on a very tight budget, this could be a good choice as it delivers characteristic Darjeeling qualities at a very low price. Still, I find that this tea lacks in the uniqueness department-- there is nothing to set it apart from the rest of the pack. The Tindharia Estate FTGFOP1 Second Flush gets a 5/10. This tea is a good value, but is too lacking in complexity to have a permanent place in my collection. Congrats on your nice Post! I have one question however. What are stonefruits? I have never heard of it before. Generally, though, I think of the "stonefruit" taste as a flavor that is more or less held in common among the different pitted fruits. If I had to try to put it into words, I think I would say it is sort of a soft, airy, fruity sweetness, but to be honest I don't think I can quite pin it down with words.